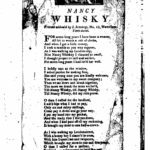 A favourite from the Clancy Brothers repertoire; traditional Scots song… Interestingly, there was a singer by the name of Nancy Whiskey from Scotland! It appears to date in one form or another to the very turn of the 19th century with the city cited as London rather than the Calton of the more popular version. 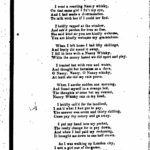 Calton was a town in its own right and alongside Glasgow, but is now a district of today’s larger Glasgow – which is why some singers will simply sing “a Glasgow weaver”. I am a weaver, a Calton weaver. I am a rash and a roving blade. To slake my thirst, it was my need! Than ever I did in a roving way! Come all ye weavers where e’re ye be! She’ll ruin you like she ruined me!